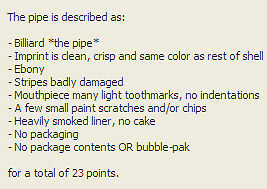 The value of pipe #191 is 23 points. George Burns and I met at the Chicago Pipe Show in April, 1999. He told me he had a bunch of the pipe he would be happy to get rid of. When I saw him again at the New York show in September, he said the same thing. I called him in late September and he sent me this one and fourteen others. They are all in pretty bad shape; even after I cleaned them up they are, as you can see from the photo, not very good specimens. However, the price was right and seven of them were new shape/color combinations for the collection. I'll keep them in hopes that pipes in better condition will turn up some day. The other eight went directly to the Pipes for Sale page for the price I paid. John Colombo decided to add it to his rotation.